How and when should I get a mole removed? Almost everyone out there has them – Moles. They pop up on our body as we get older and don’t go away. No matter the number or size, many people will need to have a mole removed in their life. There are various reasons why you may want to have mole removal surgery, including skin cancer, a suspicious looking mole, or just the plain old fact that the mole is big and ugly. Whatever the reason, the process of removal doesn’t have to be scary or painful. Why Should A Suspicious Mole be Removed? What Kinds of Complications Should I Talk to My Doctor About? The common mole (acquired mole): This is the most common type of mole on your body. Basically it is layers of melanocyte cells grouped in the first and second layer of skin. Please see detailed descriptions here. Atypical mole: These moles have irregular borders, can be darker or lighter in one part of the mole, and are usually flat and fade in with the skin. Usually if a mole becomes cancerous, it starts out as atypical. Click here for more information about atypical moles. Congenital mole: These are present at birth and have a slightly increased risk for skin cancer. Larger congenital moles have more of a risk of becoming skin cancer than smaller ones. Spitz nevus: These moles are less common. They are more commonly seen on your face, and legs, and grow rapidly in size. Color is uniform and can be red, brown, red-brown, pink, tan, blue-black, or non-pigmented. These are commonly removed or biopsied as a precautionary measure. If your mole is suspicious, your dermatologist may recommend to have it removed from your body. Sometimes, a mole is cancerous. Skin cancer is the most common form of cancer and usually starts with an abnormal spot on the body. Every year, over five million people are diagnosed with basal or squamous cell cancer. About 75% of skin cancer deaths are from melanoma. Caucasians are more likely to develop skin cancer, and those who spend more time in the sun. Tanning beds increase the rate of cancer substantially. Tanning causes more than 419,000 cases of skin cancer annually. Since most skin cancers are highly curable in their early stages, it is important that you seek treatment from a dermatologist for any kind of suspicious-looking mole. Although not all suspicious moles are cancerous, having one removed can still be a good precautionary measure that will stop possible cancer from ever giving you problems. 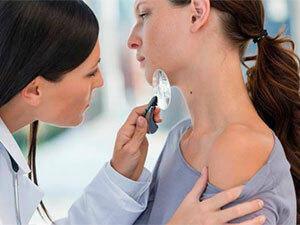 Always discuss with your dermatologist whether or not the mole is suspicious enough to have removed. Sometimes you may have a mole that is non-threatening, but just very large or ugly. You may decide to get it removed simply for cosmetic reasons. Many dermatologists will remove these moles. Infection: Since surgery opens up the skin, there is always a chance that bacteria can get inside, causing the tissue to become infected. Signs of infection include redness, swelling, discharge, pain, and heat. Always make sure you keep your surgery site clean and change any bandages regularly. Anesthetic allergy: When a dermatologist removes a mole, you will be giving some kind of anesthetic to numb any pain. Some people are allergic to different medications, including anesthetic. Symptoms of a drug allergy include rash, hives, swelling, and breathing difficulties. Nerve damage: Dermatologists must cut into your skin to remove a mole. How far they cut in depends on the kind of mole and whether or not you’re dealing with skin cancer. The further the incision, the greater risk of hitting the nerves that lie under the skin. Nerve damage causes numbness or tingling, and sometimes pan. According to the Skin Cancer Foundation, checking yourself regularly for suspicious moles greatly increases the rate of the early detection of cancer. Skin cancer is almost always curable when treated early. Although there are risks to any kind of surgical procedure, physicians agree that the benefits of removing a suspicious mole outweigh the risk. After you get a mole removed, the biggest difference you will notice in the skin would be a scar. Although some kind of a scar can’t always be avoided, an experienced Dermatologist will be able to leave the lightest amount of scarring possible. It is essential that you have the best physician possible to help you with mole removal. Skin doctors are called Dermatologists. Not only will these doctors have the best expertise when it comes to diagnosing whether or not a mole needs to be removed, they are the ones who are the most capable to do the surgery. Plastic surgeons may also be used for mole removal. They are doctors who are experts on performing surgery that leaves the body looking as natural and untouched as possible. They are most often used when dealing with delicate areas such as the face. Although plastic surgeons can send off suspicious moles to be tested for cancerous cells, Dermatologists are experts when it comes to all kinds of skin cancers. Choose a Dermatologist who is qualified, experienced, and board certified. Experience: A qualified surgeon will have done many mole removals of all kinds and be able to notice the signs of early skin cancer. Thorough: Since there are many moles covering your body, a good Dermatologist will take the time to go over all moles closely. When they do surgery, they should also be taking the time to make sure all suspicious material is removed from the skin layers. Communication: You should be able feel like your doctor is keeping you informed, explains everything involving your mole and surgical removal, and answers any and all questions you have. This is more commonly used with raised moles. A doctor will inject local anesthetic into the skin surrounding the mole, then use a sharp instrument to cut down layers until the mole is at the same layer as the skin. This technique is used more commonly on moles that are flush with the skin, or suspected to be cancerous. A surgeon will use a scalpel to make an incision, then cut the mole directly out of the skin. This is more likely to leave a scar. In cases of skin cancer, tissue underneath the skin may need to be removed. A treatment that has been developed in modern times is laser removal. It is great for areas of the body that are hard to get to, and is ideal for those who wish to avoid scarring. Laser surgery is done for those who have a mole not suspected to be cancerous. Since laser removal does not take out any tissue underneath the skin, it won’t be effective to remove skin cancer. 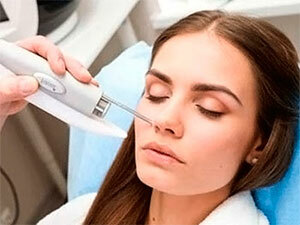 Ideal moles for laser surgery are flat and usually brown or black. Preparation: For small moles, your surgeon may decide not to numb the area. For large moles, most likely there will a local anesthetic injected in the tissue to help ease any discomfort. 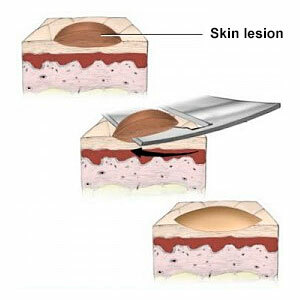 Procedure: Your surgeon will use a hand-held tool that uses a very small laser to cut away at the melanocytes (cells that make up the mole) bit by bit, until all of them are destroyed. You may notice a burning smell, and if no anesthetic was used, there’s a chance that you might feel slight discomfort. Afterward: Normally, a small scab will form over the are that has been lasered off. Make sure to keep the area very clean to avoid infection, and do not pick the scab off. It will fall off or slough away naturally. Because no cutting was involved, there is usually no scarring. If scars are present, they are far more minimal than any other technique. If a mole has been removed but grows back, contact your Dermatologist. It could be that some mole cells were left behind. Some complications from having a mole removed can include bleeding. Delayed bleeding occurs later on after surgery, and is commonly on moles removed from the lower half of the body. Unexpected bleeding occurs more often on those taking blood thinners or with a bleeding disorder. If either of these types of bleeding occur, feel free to speak with your doctor. Mole removal surgery doesn’t have to be frightening or a terrible, painful experience. There are many qualified surgeons who use techniques that can rid you of an abnormal or ugly mole very quickly. Next time you do a mole-check on your body, make sure you take note of any that may warrant a second look from an experienced Dermatologist. And whatever you do, don’t let the fear of mole removal stop you from getting it taken care of. I am looking for a physician who is able to perform Radiowave Surgery to remove a mole-like growth on my face but I am having difficulty finding one in the Seattle, Washington area. Can you refer me to one or to a qualified technician who does this? (I could also possible have it done when I’m in Tucson, Arizona next but would greatly prefer the Seattle area). Can you please recommend several experienced health professionals who do this? It would be greatly appreciated!